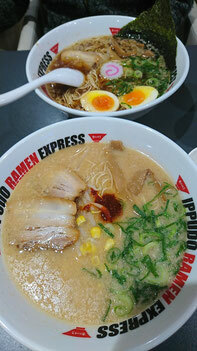 Tasty Ippudo ramen at food cort AEON Chaya. Ippudo is one of famous ramen noodle chains, the noodles are thin and the soup is tonkothu (pork borns ) that is Hakata ramen. The shops have spreaded to the World.